Scientists at the University of Louisville have shown that a microbial metabolite, Urolithin A, derived from a compound found in berries and pomegranates, can reduce and protect against inflammatory bowel disease (IBD). Millions of people worldwide suffer from IBD in the form of either ulcerative colitis or Crohn's disease, and few effective long-term treatments are available. The researchers at UofL have determined that Urolithin A (UroA) and its synthetic counterpart, UAS03, mitigate IBD by increasing proteins that tighten epithelial cell junctions in the gut and reducing gut inflammation in animal models. Tight junctions in the gut barrier prevent inappropriate microorganisms and toxins from leaking out, causing inflammation characteristic of IBD. Preclinical research published today in Nature Communications shows the mechanism by which UroA and UAS03 not only reduce inflammation and restore gut barrier integrity but also protect against colitis. The general belief thus far in the field is that urolithins exert beneficial effects through their anti-inflammatory, anti-oxidative properties. We have for the first time discovered that their mode of function also includes repairing the gut barrier dysfunction and maintaining barrier integrity." Venkatakrishna Rao Jala, Ph.D., assistant professor of microbiology and immunology at UofL, led the research, conducted by Singh and other collaborators at UofL, the Institute for Stem Cell Biology and Regenerative Medicine (inStem) in Bangalore, India, the University of Toledo College of Medicine and Life Sciences, and Dalhousie University in Nova Scotia. Jala, Singh and other researchers at UofL have been investigating how metabolites produced by the human microbiota - bacteria, viruses, and fungi that inhabit the human body - affect many areas of health. By understanding the effects of specific metabolites, they hope to use them directly as therapeutic agents in treating disease. 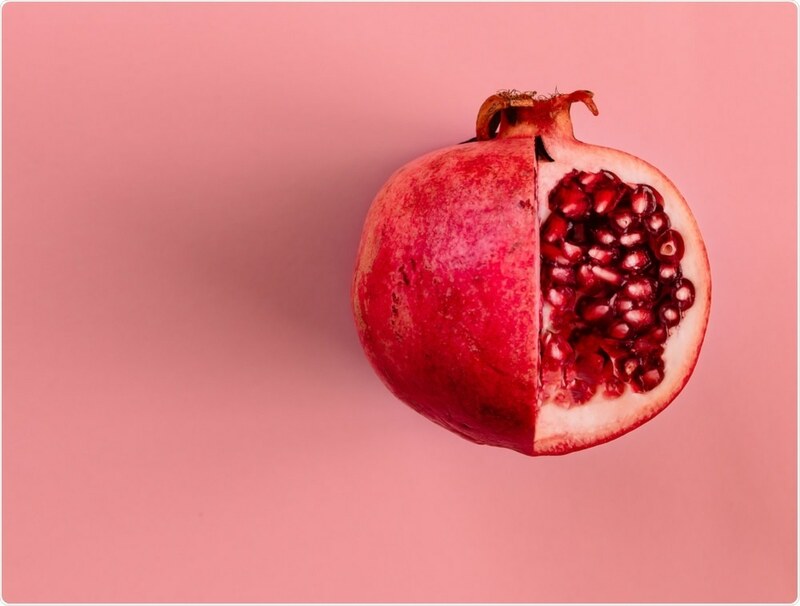 It has been reported that the microbe Bifidobacterium pseudocatenulatum INIA P815 strain in the gut has the ability to generate UroA from ellagic acid (EA), a compound found in berries and pomegranates. Variations in UroA levels, despite consumption of foods containing EA, may be the result of varied populations of bacteria responsible for the production of UroA from one individual to another, and some individuals may not have the bacteria at all. 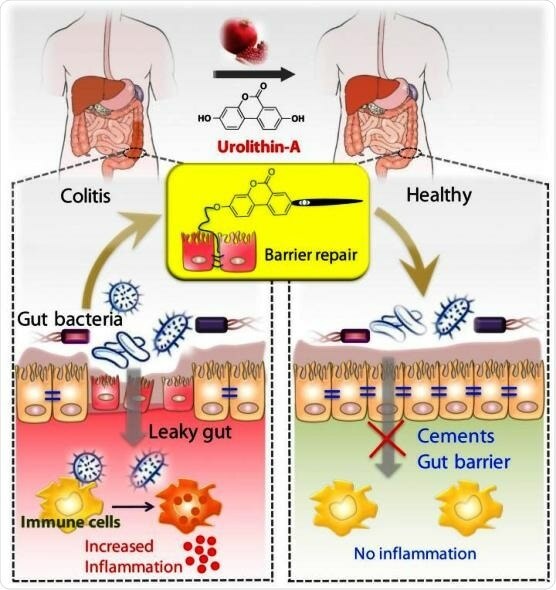 While encouraging natural levels of UroA in the gut by consuming the appropriate foods and protecting populations of beneficial bacteria should have positive health effects, the researchers believe the use of the more stable synthetic UAS03 may prove to be therapeutically effective in cases of acute colitis. Further experiments and clinical testing are needed to test these beliefs. Microbes in our gut have evolved to generate beneficial microbial metabolites in the vicinity of the gut barrier. However, this requires that we protect and harbor the appropriate gut microbiota and consume a healthy diet. This study shows that direct consumption of UroA or its analog can compensate for a lack of the specific bacteria responsible for production of UroA and continuous consumption of pomegranates and berries." Haribabu Bodduluri, Ph.D., professor of microbiology and immunology at UofL and an author of the article, said another key finding of the research is that UroA and UAS03 show both therapeutic and protective effects. Administration of UroA/UAS03 after the development of colitis reverses the condition and administration prior to the development of colitis prevents it from occurring. Illustration showing tightening of gut barrier cells and reduced inflammation due to UroA, by Praveen Kumar Vemula, Ph.D., Institute for Stem Cell Biology and Regenerative Medicine, India, and Venkatakrishna Jala, Ph.D., UofL.